The vision for the La Verne Veterans Memorial was to create a venue of respect, honor, and esteem for those fellow citizens of our community who have served and will serve in our nation’s armed forces. We envisioned a place where veterans could connect with one another, where their families and friends could pay tribute, and where each generation of the community could learn about the efforts and sacrifices of those who came before them and those who would follow. The Veterans Memorial provides a tangible testament to the service and sacrifices made by veterans from the La Verne community. The memorial is located on the corner of Magnolia Street and Bonita Avenue in front of Veterans Hall. 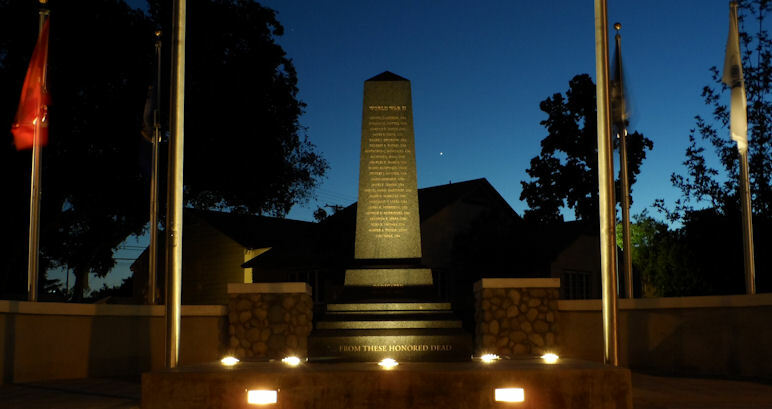 It features an obelisk with the names of the men and women from La Verne who gave the ultimate sacrifice for our freedom. It also features flags representing each branch of the military, park benches, and landscaping features. Please join in paying tribute to the valor and contributions of all who have served our country by helping us complete our fundraising and fund the maintenance of this memorial. Become involved today by making a donation, purchasing a brick, or assisting with our community outreach. You can download the form to purchase a brick or make a donation and bring it into the La Verne Community Services Department. If you would like to become involved with this project in any way, please contact us at info@laverneveterans.org.